We got up at 6am this morning and it was a mild morning - around 5 degrees and no wind to speak off until just before we set of at 7.40am. 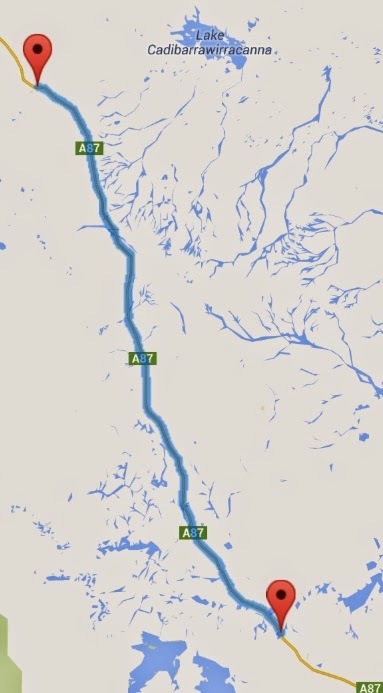 The wind is blowing an east north east so it will be a cross headwind for the first half and then predominantly a cross tail wind unless the road starts veering towards the east! Since it is a warmer morning we don't have to have many layers on - I even went 'sockless' if there is such a word. 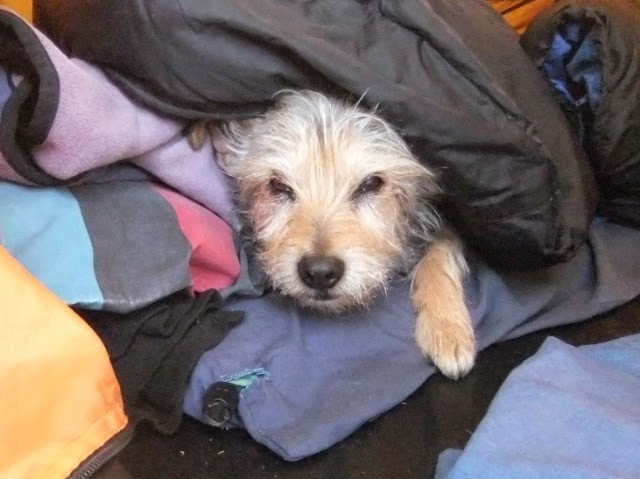 he sure loves the sleeping bags and tolerates us when we deliberately thow it over him! I forgot to mention that Coober Pedys' water is drinkable yet coloured! Especially first thing in the morning the hot water has a brownish reddish tinge to it and by the end of the day it is almost clear. We got our water from the rainwater tank although to fill up the caravans there is a water bowser through town or 2 opposite the caravan park next to the information center and it literally is a water bowser! 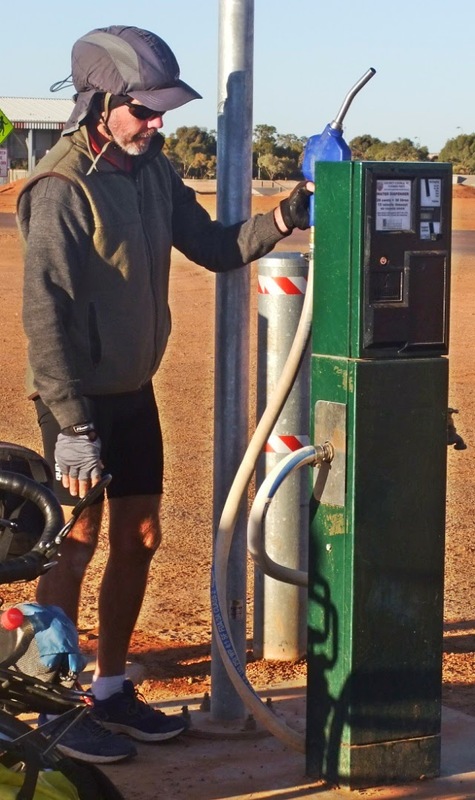 It 20 cents for 30 litres - here is Neil pretending to 'fill up'! as you can see by the last photo it truly looks like a petrol bowser. 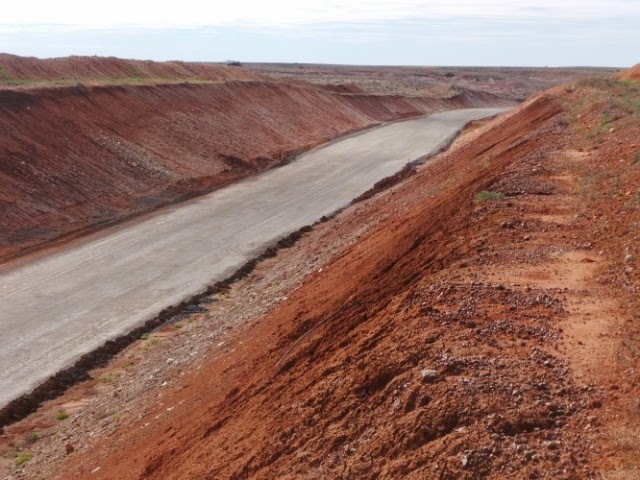 LOL upon coming to Coober Pedy whenever I dug my toilet hole I always hoped that I would strike an opal ... now I think when I dig my toilet hole that I might just find a missile! 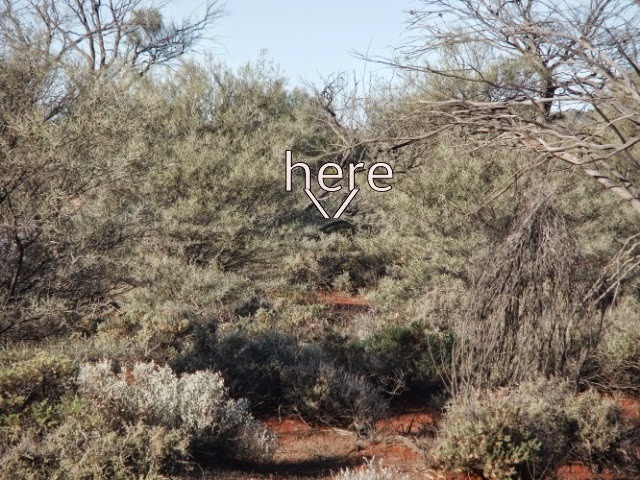 This area lasts for quite a while and won't be until around Woomera when we leave this zone. 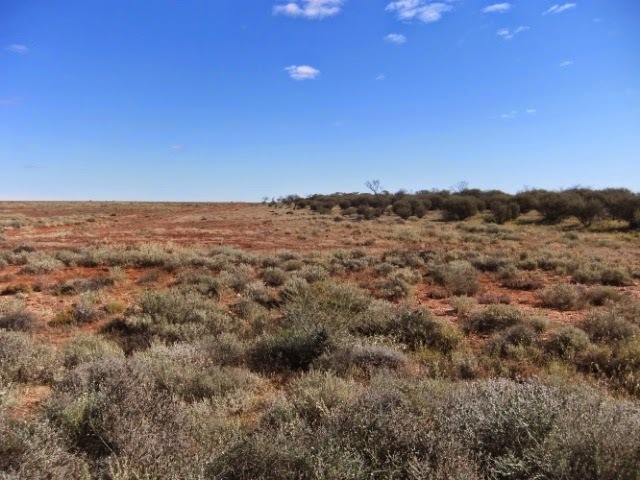 it wasn't until around 60km that we came across another 2 very close together and there was a sign by Arrium - we had seen their mining cars in Coober Pedy and they are mining for Iron. So roads like the photo are actually going under the highway and we are wondering what it was made for - rail connection? or for trucks as the roads all run perpendicular to the highway and we can't see where it comes from and where it goes too! 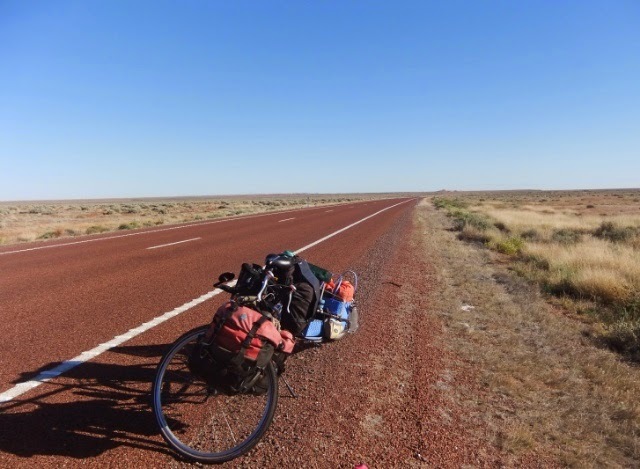 We push the bikes of the road and as you go into the scrub it becomes very sandy and almost impossible to push the heavy bikes through the sand - I have to take the heavy front panniers off so I don't sink, also Kouta has to get out! For Neils bike we just took the back yellow bag out. It is an okay spot - heaps of flies and a bit too much sand for me - it gets into everything! Tomorrow hoping for the same - winds and distance cycled! Tell you what I am over red sand! Sand is in everything - clothes, inside the tent, usually at the bottom of the pots and also in the food, it is everywhere I even find some at the bottom of my coffee cup! 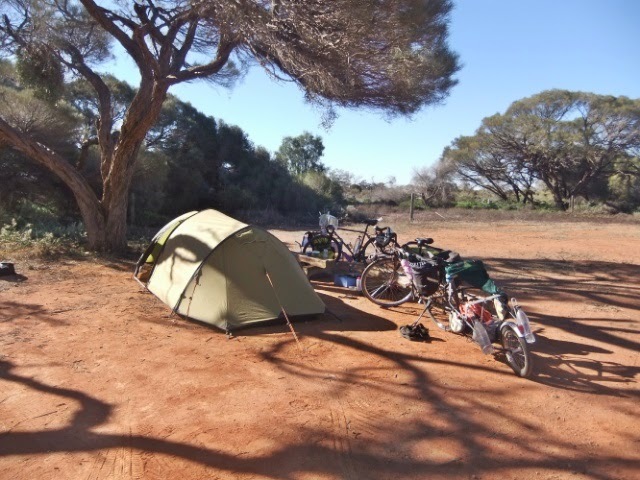 So this morning was a lot longer in packing up, around the bushcamp the sand is like being at a beach and we had to carry all the gear down to the bikes where they were parked as the ground was firmer. We didn't get going until 8am and there was no wind anywhere. 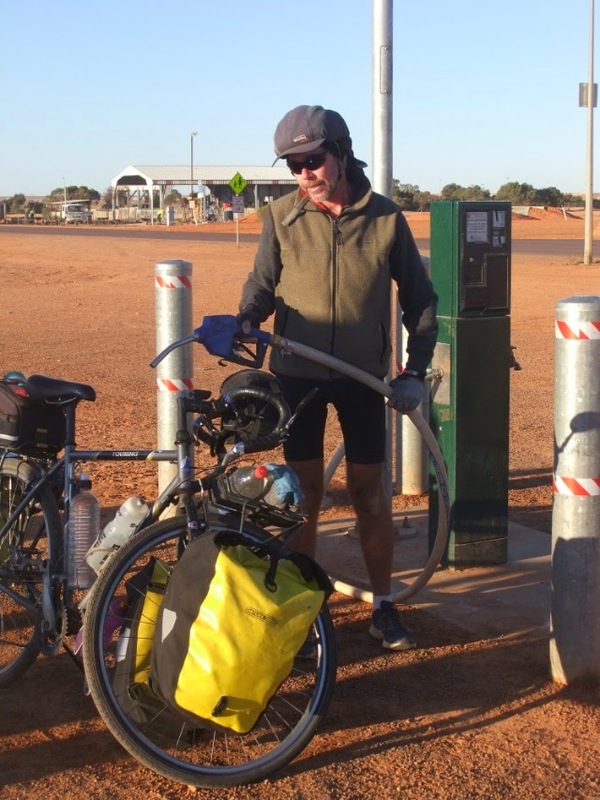 We rode the 9km to Ingomar Rest area and picked up some water. This rest area is on top of a hill and is very exposed to the wind, it is not really suitable for tents - in fact there was no where for a tent! We were hoping to get past Bon Bon rest area which was about 85km today but the wind just wasn't in our favour. We had really no wind or very light winds up to lunch time and it came from the east. After lunch the wind swung towards the south, albeit light it wasn't expected - the winds were suppose to be swinging towards the north today and for the next 2-3 days so we are not hopeful for a northerly tomorrow. So I found the going a little tough today - if you remember last night I described our dinner of dehydrated tofu ... well I had a sore tummy today - no bad bowel movements just a sore tummy and whenever I ate today it hurt ... I couldn't figure it out and to top it all off my back is a little sensitive as Kouta is moving a fair amount now and the jarring on the back takes it toll. So I perservered as there is really no need to stop cycling. 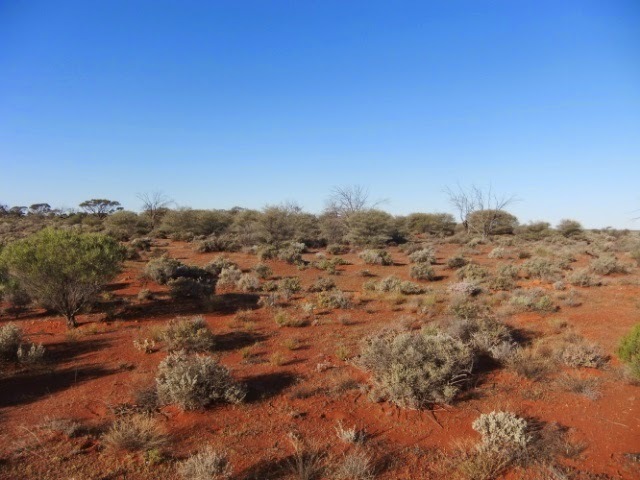 One thing that was positive about the scenery now is from about 100km south of Coober Pedy there became more bush so a bushcamp is easy to find and it was like that for most of the way just a few spots here and there where it is bare. 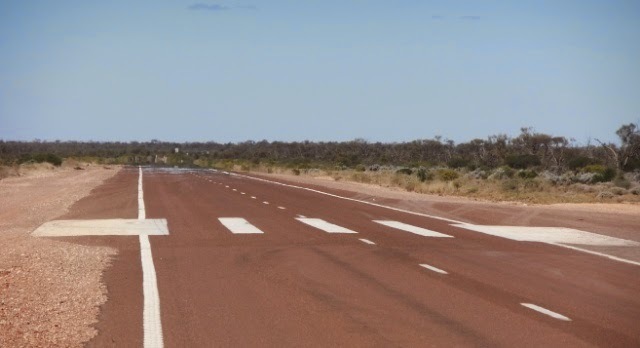 and this is what they have done to the highway - turned it into a mini runway! 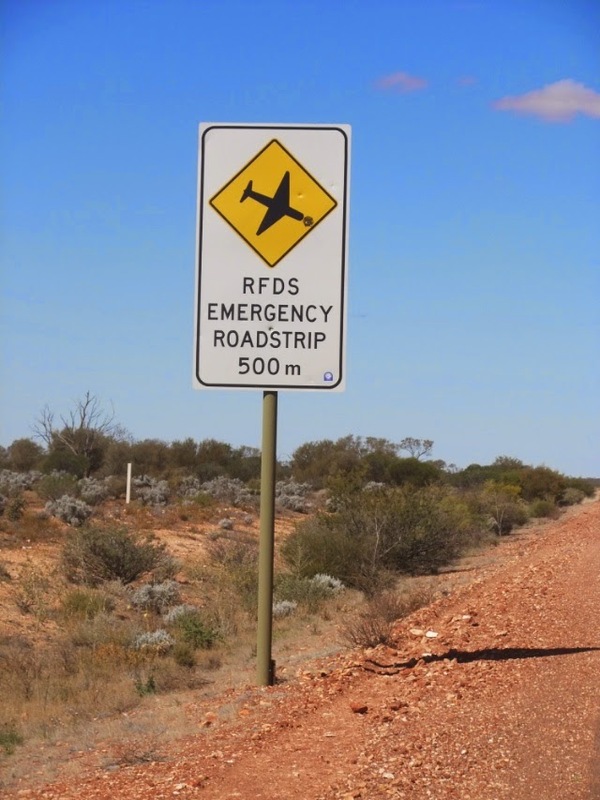 the RFDS stands for Royal Flying Doctor Service - think Flying Doctors Sharon! Alas no planes landed as we rode by! 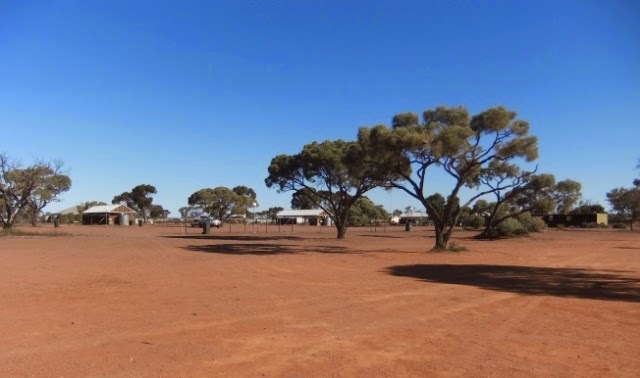 We get to the 400m sign for Bon Bon rest area and we can see that the rest area is out in the open, it does have a toilet and water tank but no where to strip and wash so just before it there was a group of trees and we are behind them, here is a photo taken from the road ... can you see us? And this is the site we are at, plenty of bush to hide behind and it is firm sand and not soft! By the time we got here I figured out what was wrong with my tummy - last nights dinner - the seasoning for the tofu was really really really chilli hot and I think the chilli burnt my insides!!! So tonight I had my part of the tofu without the seasoning and Neil only had a little - his was still a little too hot for him so even less seasoning next time! But mine was better without the seasoning and only a little soya from the noodle packs and some coconut milk. My tummy is a lot better now ... as is the back! 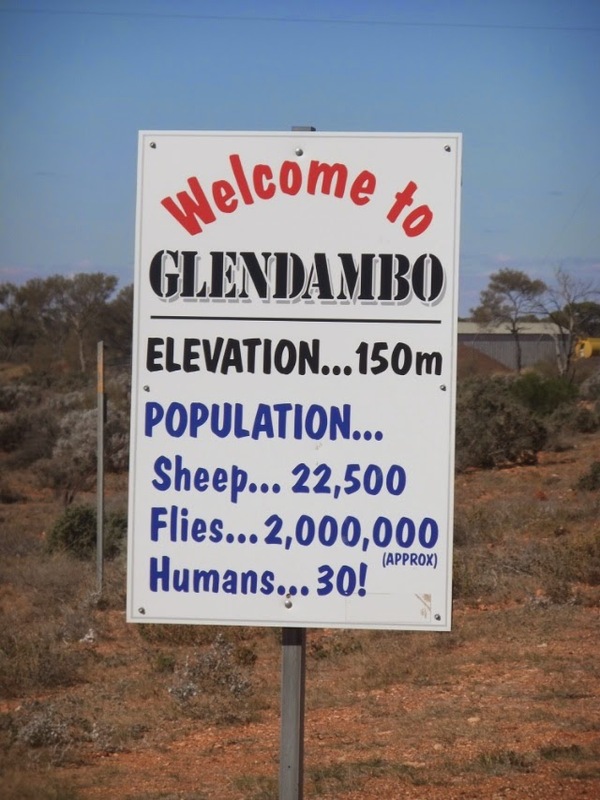 Tomorrow we will make Glendambo which is another 85km away. A warm night last night and by the time we go on the road the layers came off. A light breeze began early and it was coming predominantly from the east (and not the north like predicted). The first hour had no wind and then we had a cross wind. Alot more traffic today especially tourist traffic - caravans, cars and trailers, utes/4WD loaded to the hilt with camping gear. 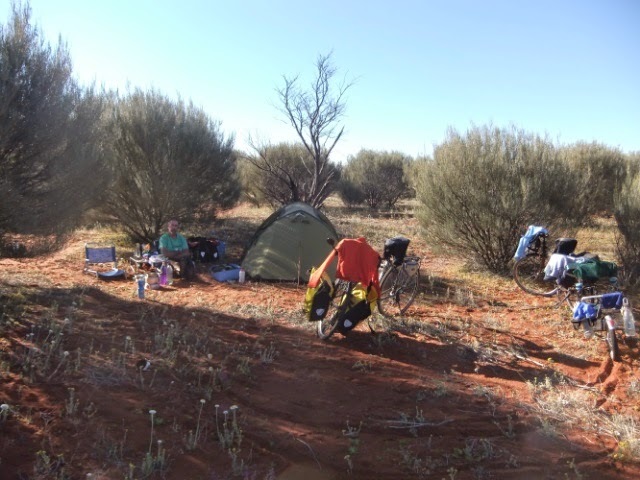 A fair bit of bush camping is possible between Bon Bon rest area and Glendambo but I think after Glendambo it might become a little scarce as we will be passing salt lakes. 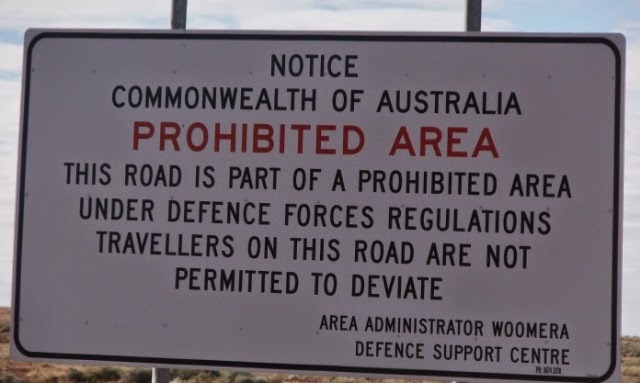 Just before getting to Glendambo we exited the restricted zone as cautioned by the Department of Defence - not that they patrol the area! As we rode along today the wind was playing havoc with us - sometimes it was a cross wind, then a headwind then a tailwind ... all in a space of about 1km - not sure what it was doing but by the afternoon it had settled and was coming from a north east direction - so for the last 20km we had predominantly a tailwind ... better than nothing. this wind is suppose to be here tomorrow but we swing more east than south! 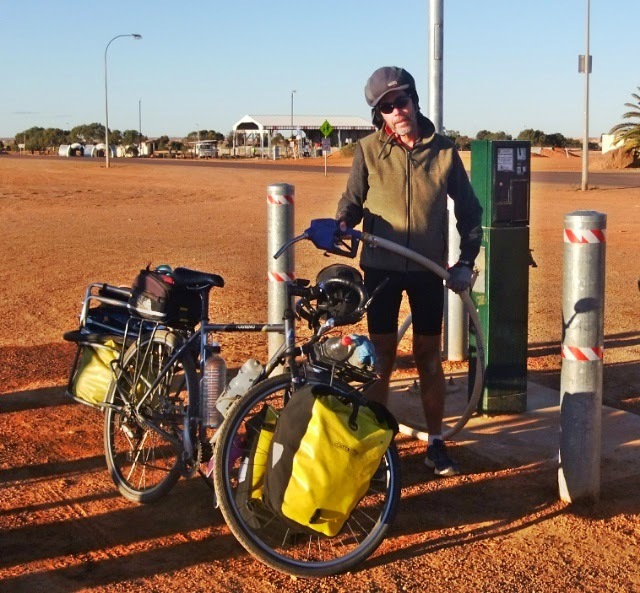 it is all bore water and they have rainwater tanks that are nearly empty so we loaded up a few bottles but only have to go 70km tomorrow before getting to a rest area with water. The showers in this park has very hard bore water, no lather what so ever! 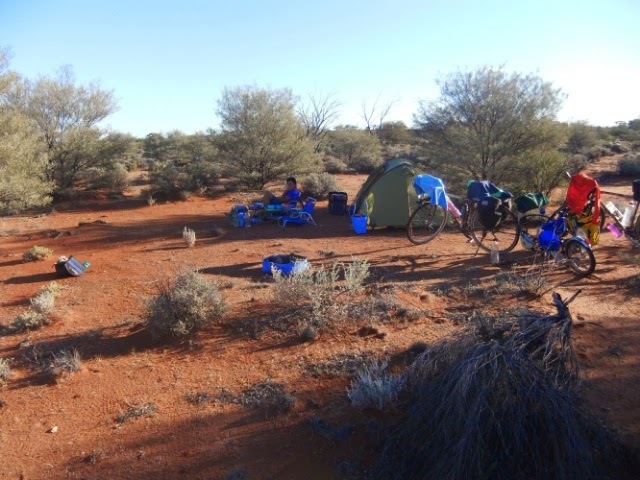 I think in hindsight we should have carried some extra water and continued 1 or 2km down the road and bushcamped instead of wasting $23 I think I can go another day without a shower! Tomorrow we head for Lake Hart rest area - a salt lake ... last time I was here this was a beautiful spot at sunset ... although I am not holding my breath on that anymore!